Another speciality tribute item, this sword is another interesting object. There were many tributes like this, not necessarily swords. I've see plates, motorcycles, figurines (like firefighters), etc. 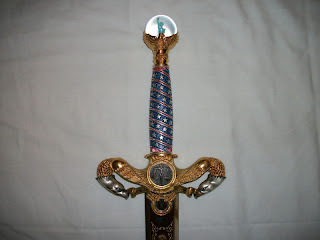 The American Liberty Sword by Marto of Toledo Spain was created in memory of the 9/11 Twin Towers disaster and terrorist attacks of September 11th, 2001. 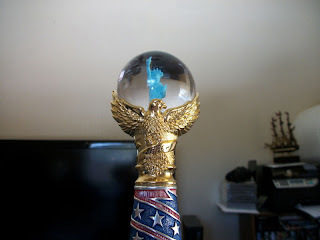 From the top (pommel) of the sword to the tip of the blade, this exclusive sword depicts in symbols the indomitable spirit , love of freedom, liberty and justice of the American people. The pommel of the American Liberty Sword is a clear resin globe , with a scale reproduction of the Statue of Liberty encased within, held aloft by an eagle with wings spread. The hangrip depicts the American flag with the stars and stripes. 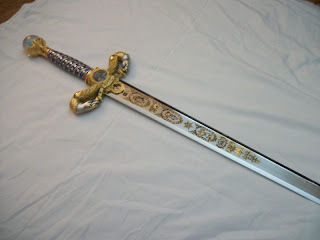 The quillons of the guard are fashioned with two 24K Gold plated American eagles joined together by a ribbon with the words "E Pluribus Unum" (Out of Many, One) inscribed. The center piece of the guard features a medallion showing the "Scales of Justice" in relief. 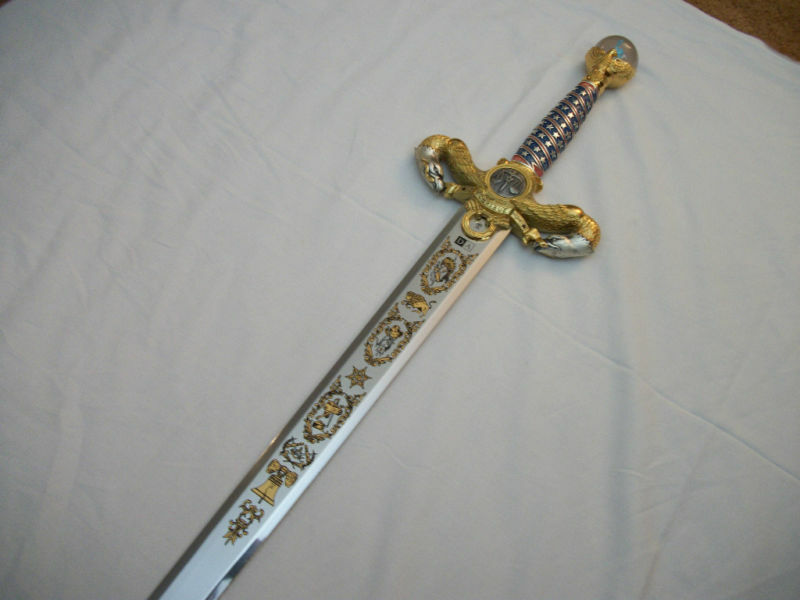 The tempered stainless steel blade is decorated with 24K Gold etchings depicting numerous historical American symbols including the Liberty Bell and American Indian and cowboy tributes. 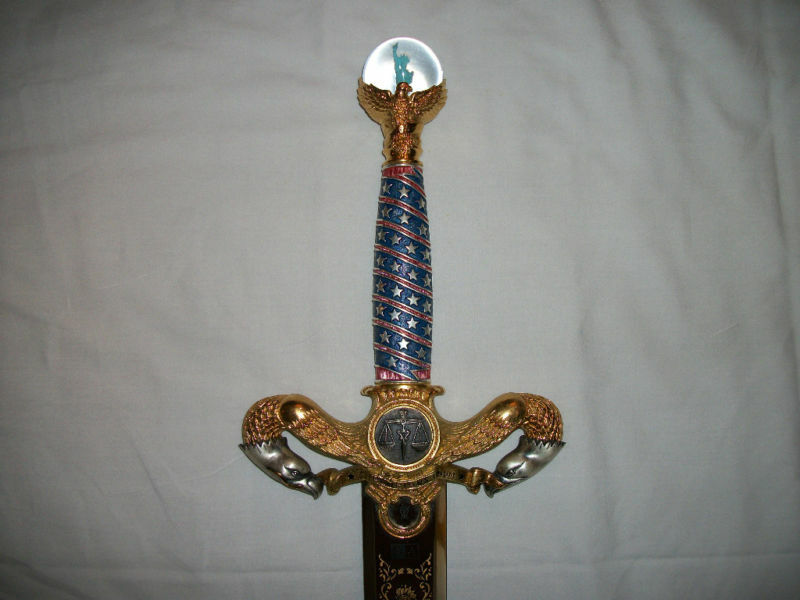 Whether a collector of swords, Americana, or JUST A PROUD AMERICAN , The American Liberty Sword by Marto of Toledo Spain is an art piece to display with PRIDE!